Tom Brady passed for 340 yards, and the New England Patriots got a 28-yard field goal from Stephen Gostkowski as time expired on Sunday night to beat the Chiefs 43-40 at Foxborough, dumping Kansas City from the unbeaten ranks. 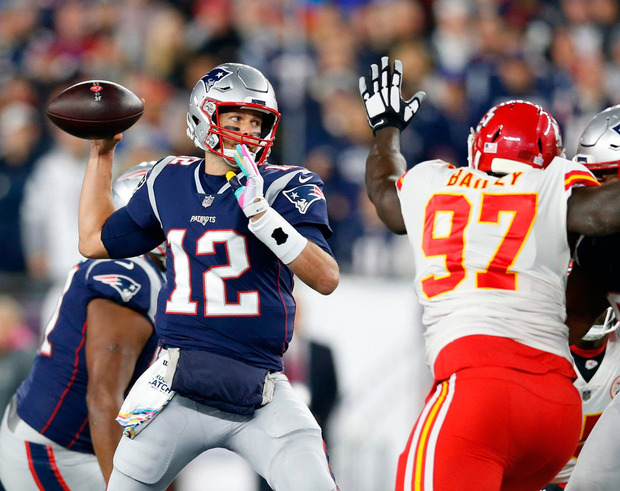 Matched against a first-year starter, Chiefs quarterback Patrick Mahomes, Brady led the Patriots on a game-winning drive in the final three minutes. His 39-yard strike to tight end Rob Gronkowski gave New England (4-2) a kick to win it in the final seconds. The win was the 200th in the regular season for Brady as a starting quarterback. Sony Michel added 106 rushing yards for New England. Mahomes countered with 352 yards passing, going 23 of 36 with four touchdowns and two interceptions for the Chiefs (5-1). Elsewhere, Todd Gurley rushed for two touchdowns and a career-best 208 yards on 28 carries as Los Angeles remained undefeated, holding on for a victory at Denver. The Rams improved to 6-0, their best start since the 2001. In the shock of the weekend, quarterback Dak Prescott threw for two touchdowns and ran for a third as host Dallas Cowboys embarrassed Jacksonville in Texas. Prescott completed 17 of 27 passes for 183 yards while rushing for a career-high 82 yards on 11 carries. Running back Ezekiel Elliott pounded out 106 yards and a score on 24 carries, while wide receiver Cole Beasley torched the heralded Jacksonville secondary for nine catches, 101 yards and two touchdowns. Kicker Brett Maher added four field goals, including a career-high 55-yarder in the fourth quarter, for Dallas (3-3). The Cowboys sit a half-game behind first-place Washington (3-2) in the NFC East.